Indulge in our breathtaking White Lotus Suite, the embodiment of an arresting Zen Garden and step into luxury in the heart of a primal volcanic landscape. Contemplation in our peaceful haven helps release the burdens of urban living and stills the unquiet mind. Like the gentle lotus flower, submerse yourself in the comfort of our plush king size beddings and fine linens for a restful night’s sleep and awaken to a new dawn, revitalized and refreshed. Steeped in rich Korean ancestry, let your imagination wander and savor authentic beacons of a time gone by, the cherished Bandaji Jhang chest, Bamboo Wife and Scholar’s hat, symbols of noble anonymity and universal quest for knowledge. Linger in our elegant master shower with stunning forest views and spoil yourself with our hand delivered homemade gourmet breakfast. 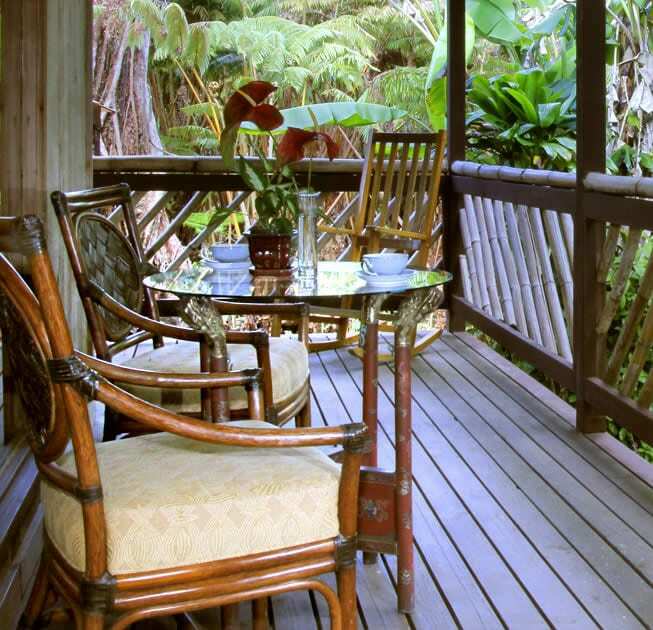 Fill your day with nature tours and hikes or simply unwind with a tropical beverage in a lazy hammock on your private lanai. Curl up by the warm hearth with a good book or soak in the hot tub and gaze out as verdant hues capture the forest light. The restorative powers and delicate embrace of this charming hamlet await the weary traveler. Perfect for couples. Rates are based on double occupancy. Please call for discounted rates for 3 nights or more.